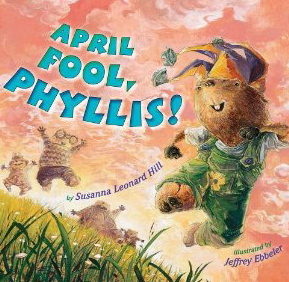 The publishing industry is full of wonderful people. Today, Kai has asked for a few words sharing the love of those people. I could talk about my husband, who is not in the industry except as a consumer, but who believes in me when I don’t believe in myself. I could talk about my agent, without whom I wouldn’t be where I am today. I could talk about a couple of fabulous editors who loved my work enough to take it on and help me polish it until it shone. I could talk about librarians who have loved my books enough to spend part of their ever-shrinking budget on them, or about teachers who have brought me and my books into their classrooms. They are all worthy recipients of my industry love, and they all have it. But today I’d like to mention someone else. He owns an independent bookstore in a small town. What with big chains, the internet, and the move into the electronic age, owning an independent bookstore is not a job for the faint of heart. 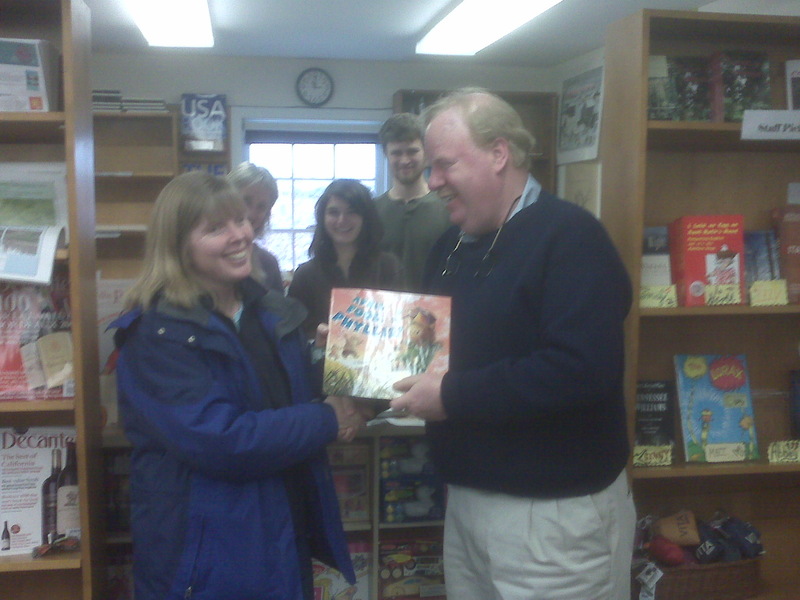 Scott Meyer has owned and run Merritt Bookstore in Millbrook, NY since 1983, although he didn’t sell his first book until 1984. In the beginning, he didn't have enough stock, so he went to the local library each week, borrowed books for his window display, and put up a sign telling people that if they wanted to read the books they could get them from the library after he returned them, and if they wanted to own the books, he could order them! It gave him a window full of books, helped his fledgling business off the ground, and promoted the local library. Since then, in spite of tough times, Scott’s business has grown and flourished. He loves books, and he loves authors. Ever since my first book, The House That Mack Built, came out in 2002, Scott has taken care to keep all my books in stock because I am a local author. He has mentioned me to teachers looking for an author to visit their classrooms. He has invited me to school book fairs to introduce my books to new people. He has included me in the town book festival he was instrumental in starting, and Community Day, and the New York State Sheep and Wool Festival with Can’t Sleep Without Sheep, and any other opportunities he sees. He works tirelessly to promote books, and reading, and authors. So I’d like to share today’s industry love with Scott, and with other independent bookstore owners who are struggling to keep their businesses afloat in these changing times. All towns are much nicer for those cozy corner bookstores with their warm lighting, their shelves full of stories, their knowledgeable staffs, the personal recommendations they can give knowing just what books will appeal to their customers, and the sense of community they provide. 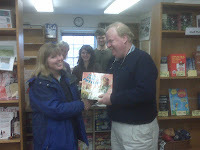 Thank you, Scott, for all you do and for your wonderful independent bookstore! Thanks so much for having me, Kai. I have been enjoying all the posts in your theme weeks here! You are fast! I'm happy to share your great story. Thanks for participating, Susanna. You are always welcome here. I wish I had a Scott! Thanks for stopping in Robyn. Nicely said, Susanna!! Warms my heart- Scott and Merritt are a wonderful resource to the community AND the industry!! A true inspiration. We are lucky to have people like Scott in our community. What a wonderful post, Susanna. I always love watching "You've Got Mail"...not because the big bookstore wins out...No way!...but because I love to see The Shop Round the Corner. I just want to hang out there. Our town doesn't have any independent bookstores. It is so nice to hear Scott's story, and I'm so glad you posted the pictures too. I wish I lived close enough to hang out in Merritt Bookstore. I love Scott's entrepreneurial thinking about his window display! Brilliance like that is what is needed today by book sellers and book writers alike, in order to succeed. Cathy, you are so right that today's indies need extra entrepreneurial spirit! They have to get creative and become an important resource for the reader, author, community. Thanks everybody for stopping in. Wow, I haven't met him yet, but Scott sure sounds like my kind of person. Love it! What a wonderful story to hear, and I love the way Scott started his business! Here's to Scott and creative booksellers everywhere!